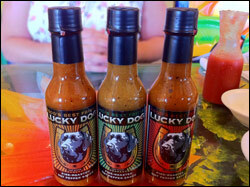 Sonoma, CA-based company Lucky Dog Hot Sauce is what Scott Zalkind started after his 6-plus-year hobby began to flourish. Zalkind fire-roasted chile peppers and garlic and combined them with other fresh ingredients into, in his words, “thick, savory and extremely versatile hot sauces” (that sounds good already!). He doesn’t use pepper mash at all; and although he employs a bit of dried chiles, most of the flavor is derived from the unique, quasi-smokey tones of roasted peppers.